& If, in removing the cards ior this effect, you notice that one of them is signed or initialed from a previous trick, bypass it and remove a five-spot of the same color instead. Otherwise, the marked card might show up twice during one of the false counts. & As you may have noticed, I don't provide any elaborate justification for making three cards travel rather than some other number. You can, ii you wish, force the number three on a spectator using any of the methods employed in other routines. My own feeling is that such ploys complicate the plot without strengthening it. Instead J use an idea suggested by my friend David Malek. After causing the third card to travel invisibly across, I simply say, "That should be enough." If you say this casually but confidently, everyone will accept that three cards should indeed be enough to prove your point. 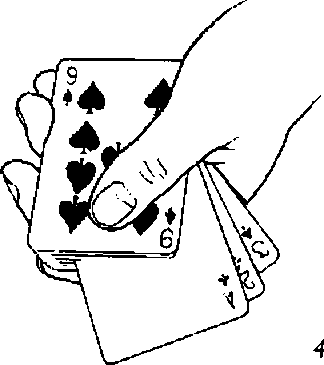 & A common method of presenting the climax in Cards Across is to turn to the spectator and say, "If I really made three cards travel to your packet, how many should you have?" The spectator responds "thirteen" and the performer has her count the cards to show that she does, indeed, have thirteen. I think this approach is a mistake for two reasons. First, any time you ask a spectator to perform even the simplest arithmetic problem, you're asking for trouble. Here is an exchange from a video I watched recently of a magician performing Cards Across. Magician: "You were sitting on seven cards. If I actually gave you two, you have?" Spectator: "Five." I think, however, that there is an even bigger problem with this approach. 0 you ask the spectator how many cards she should have and she says seven, then counts seven—or she says thirteen, then counts thirteen—the count has an anti-climactic quality to it. In my approach, you don't ask the spectator how many cards she should have. You ask how many she did have at the start. When she says ten, the audience is psychologically prepared to expect ten on the next count. (It doesn't matter that, intellectually, they know that, if you've made good on your claim of transferring three cards, she should have seven. We're talking about psychology, not logic.) When, instead, she reaches seven and has no more cards left, it has a real impact on the audience. Similarly, the second spectator having confirmed that he also counted ten cards earlier, when he reaches ten and still has cards in his hand, it's a real moment.